Mobile phone accessories/repair shop on North End near West Croydon Station. It sells mobile phones, mobile phone accessories, watches, bags, and suitcases. It opened in January or February 2016. According to Ward's street directories, in the mid-1930s the premises were occupied by Zeeta Caterers. The London Tramways website has a photo of the shopfront around this time. It was H Purchen pawnbrokers photo from August 2011 by 1967 (see London Road History article). This closed down in late July or early August 2015 — as of July there were signs in the windows indicating a closing-down sale, and by August the shutters were down every time we walked past. It remained vacant as of December 2015, but as of early January 2016 there was some sort of building or shopfitting work going on inside, and by mid-February 2016 it was open as a mobile phone accessories/repair shop (though with no name on the frontage photo). 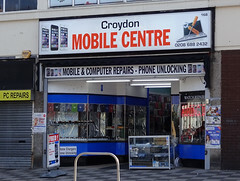 By April 2016 a name had appeared: Croydon Mobile Centre. Last edited 2019-01-08 17:11:10 (version 47; diff). List all versions. Page last edited 2019-01-08 17:11:10 (version 47).